Stephen Ormond will fight in his native Belfast tonight against Paul Hyland Jr. Pic: Sportsfile. IBF European lightweight champion Paul Hyland Jr meets a determined Steve Ormond for a 12-round decider in Belfast tonight. The Clondalkin fighter, a former WBO European champion, is the unsung hero of Irish boxing. Ormond (24-4, 13 KOs) made his pro debut in Killarney in 2008. Since then he's fought just four times in his home town. He won the WBO European title in London in 2013 and successfully defended the belt in London, Liverpool and Belfast. 'The Rock', as he's called, has a gritty, old-school style and can bang. "Steve has had 12 fights shown on Box Nation," says coach Paschal Collins. "If any of those had been seen by a Sky Sports audience, he'd be a household name by now." Ormond lost his title in a fractious scrap with Terry Flanagan in Wolverhampton two years ago. The fight ended with disqualification for the Dubliner when he reacted unprofessionally to the holding tactics of the rangy southpaw. Unfortunately for Ormond, current title holder Craig Evans adopted the same tactics in June. "With Evans, also a southpaw, Steve got frustrated and didn't box to his potential," explains his cornerman Collins. "It wrecked his head. It was as if he was suffering from post-traumatic stress." While no one is under-estimating Paul Hyland Jr (16-0, 6 KOs), the Ormond camp are bullish about their man's prospects tonight. "We reckon Stephen's experience will win out," says Collins. "Mentally and physically, he's in a great place. Stephen's had great sparring with Chris Jenkins and Josh Leather. And he knows that he's already beaten Adam Dingsdale, who Hyland took the title from. He's put the work in and there's no pressure on him this time out." 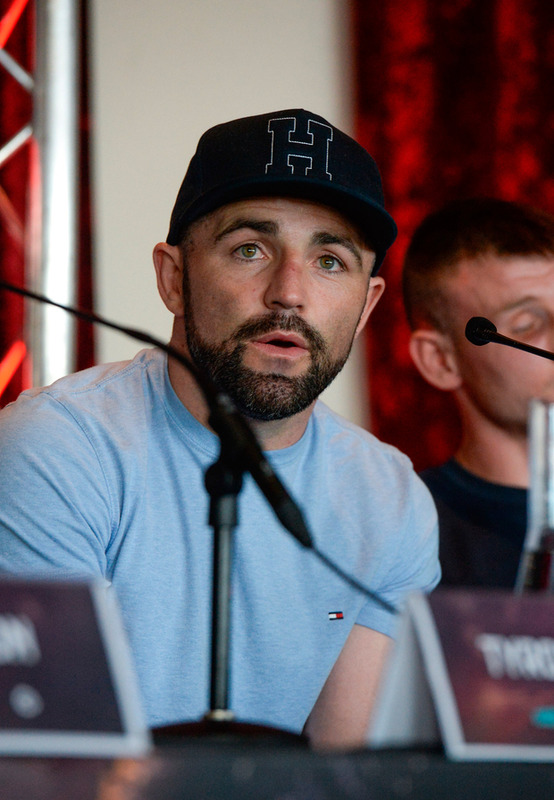 "I respect that he's boxed at a higher level and I'm expecting a war," says Hyland. "But it's my time to take over." Ormond (34) shrugs off speculation that he might retire and points to his peak physical condition. "I'm feeling great for this fight," he says. "It's going to be energetic and entertaining." Fitter and more focused than ever, Ormond believes he can surprise people in Belfast. "This is a 12-round fight," says Collins. "We'll be taking it round by round. "We have a game plan and, given his greater experience of big-pressure nights, I expect Stephen to stick more with his boxing. But don't be surprised if Stephen wins this in the early rounds."